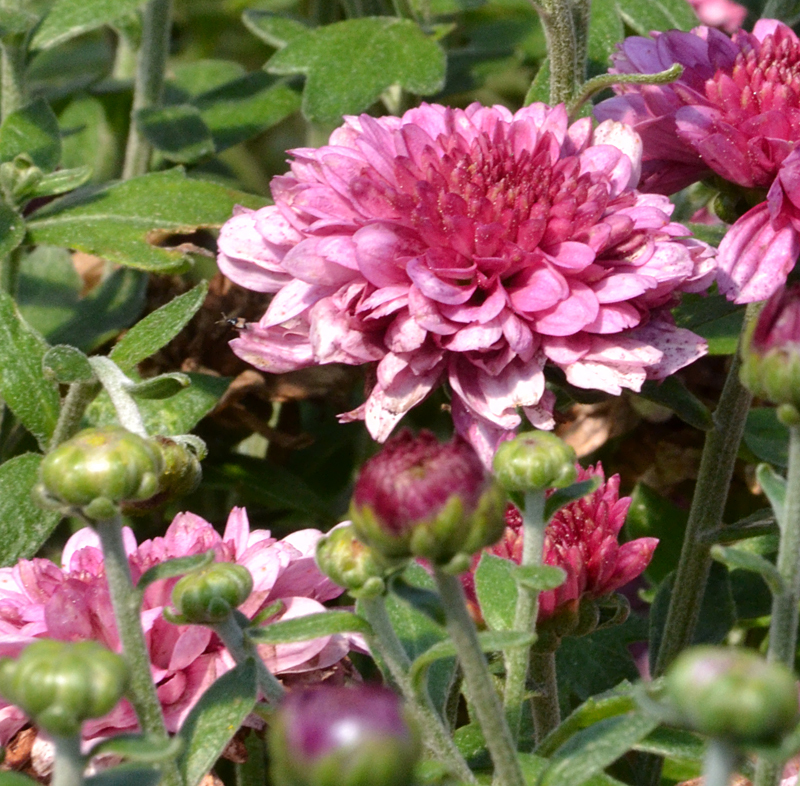 Should you treat mums as perennials or annuals? For almost all the varieties that you will find for sale in Western New York, the answer is no. Local growers will call them fall mums or garden mums, but they won’t call them hardy because they’re not. And they definitely won’t call them perennials. There are two reasons that mums aren’t considered perennials, according to staff at Lockwood’s Greenhouses in Hamburg and Mischler’s Florist and Greenhouses in Williamsville. 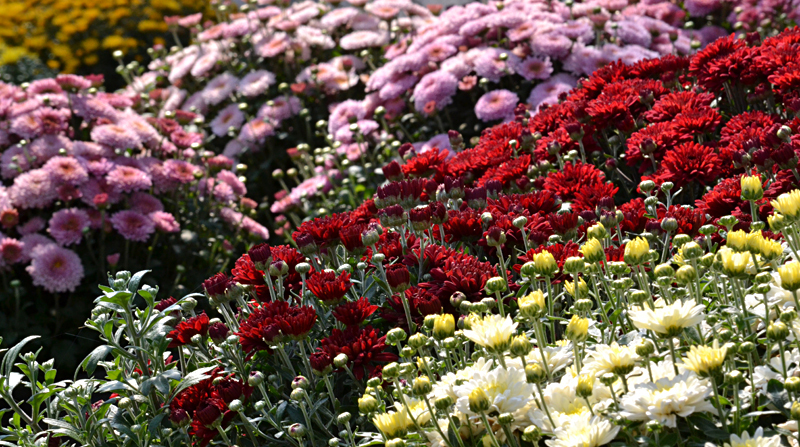 The first reason is that mums are now bred for flower size, flower color and plant shape. They look great, but much of the hardiness that mums used to have has been bred out. The second reason is that mums should be planted sooner in the season, by around August, if the plants are going to make it through the winter. But gardeners aren’t really interested in mums until they begin to flower. By then it’s too late. If you try to plant them now, they won’t have enough time to root well and the roots may heave up out the ground. “It’s the heaving that kills them,” said Teresa Buchanan, garden center manager at Lockwood’s. Buchanan says the chances of having mums survive the winter are 50-50. If you want to try to get them through the winter, she offers some tips below. Mark Yadon, vice president of Mischler’s, thinks the odds of getting fall mums through the winter are even lower than 50-50. Besides, even if you do get the mum to overwinter, you will have a plant without flowers taking up space in your garden throughout the summer. He recommends you treat mums as annuals and place them in your garden in fall. See his thoughts below. If you look very carefully, you may find one variety of mum called ‘Mammoth’ that actually is a perennial. Lockwood’s carries it in its perennials section, away from the other mums. Lockwood’s had only a few specimens left this weekend. Buchanan noted that the flowers on the ‘Mammoth’ are more daisy-like and don’t have the rounded flower that many gardeners like in a mum. If you want to try to overwinter your non-hardy mums, Buchanan offers some workarounds. The first method is to overwinter the plant in its pot in a sheltered area, then plant it in the spring. When your pot of mums doesn’t look good anymore and the foliage is dried, trim back the dead tops. Water the pot and place it in an unheated garage. Keep the soil barely moist; it can’t be dry. Plant it in the spring; by April you should see new green growth sprouting. It will have all summer to root into the ground and you have a better chance of having the plant survive the next winter. The other method you can try is to plant the mum in the ground now– the earlier, the better, Buchanan said. Keep it well watered. Spread a thick layer of mulch to help protect the roots. If we have a lot of thawing and freezing, the roots can heave out of the ground, which is what kills them. Check them early in the spring. If the roots are heaving out of the ground, stamp the roots down with your foot. Even if you do all this, there are no guarantees that your mums will act like a perennial. “You really have a 50-50 shot at it,” Buchanan said. Yadon doesn’t recommend trying to overwinter mums in your garden. Even if you’re successful, you have a limited amount of space in your garden. Throughout spring and summer, you’ll have a plant that is just green and has no flowers. While some plants don’t need flowers to be appealing, maybe a mum isn’t one of those plants. Mums will bloom for about a month, he said. 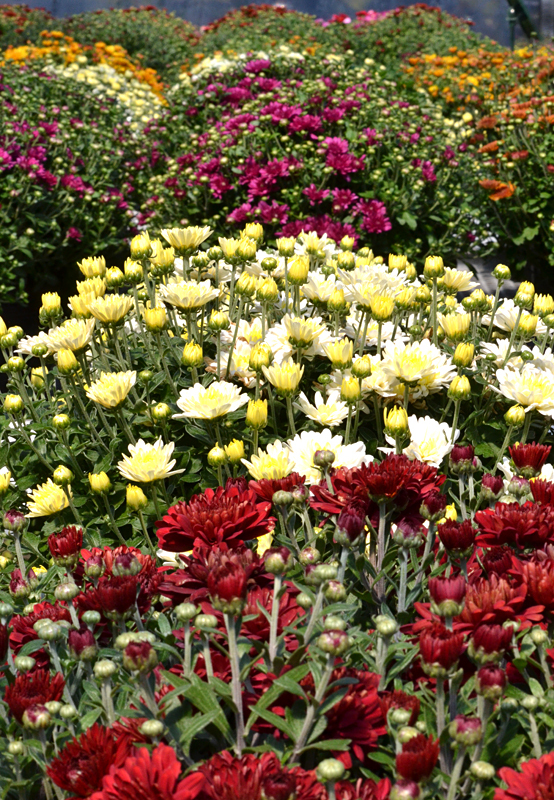 There are early-season, mid-season and late-season mums. They bloom at different times, depending on the variety. Early-season mums are blooming now; mid-season mums are just beginning to open and late-season haven’t started blooming yet. 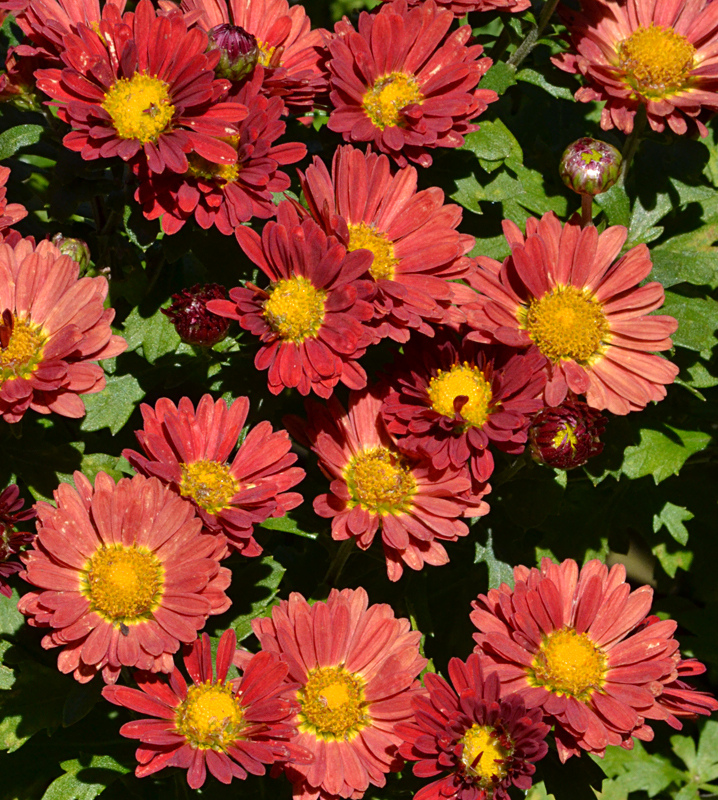 If you want flowers for Halloween, you want late-season mums. Mums are somewhat frost tolerant, he said, but not totally frost tolerant. A good frost can damage opened flowers, but unopened buds should open normally. Yadon sees mums as decorations for the fall to be used in patio pots. If you plant them in your garden, he suggests pulling them out when they die and putting something else in their place in the spring. great, informative article. I like the different takes on mum hardiness you offered here. This is people’s number one confusing thing for fall planting, and it’s tricky to explain…yes, lots of us remember (and still enjoy) our grandmothers’ Mums in their gardens. Now we understand why things have changed. Colleen, thanks for your comment. I thought it was interesting getting the different views, too. Plus, I think many people are disappointed when their mums don’t come back and have no idea what went wrong. We sell mums every year and every year people ask how to keep them. So now I can suggest not planting them till spring or summer. And plant maybe on a raised place so won’t stand in water. And that there’s a 50/50 chance of them coming back.